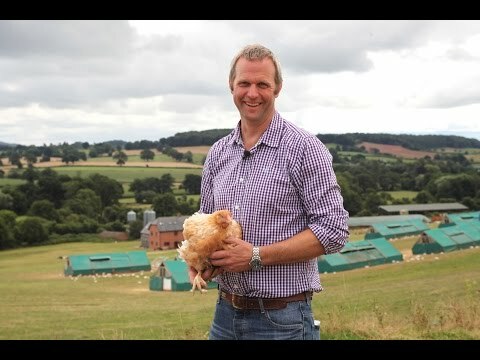 Chris Labdon has been tending his organic chickens to the highest standards of welfare on his Wood Green farm in Devon for years and years, and so well that he's won the Good Chicken Award from Compassion in World Farming. Chris’ chickens take months, not weeks, to grow. Their feet are made for walking (and that’s just what they’ll do). These chooks have plenty of time and space to explore the world, scratching and clucking about from first thing in the morning till last thing at night. All this time spent growing means they develop their muscles properly, so from breast to the thighs and wings...this is chicken that tastes like chicken. Some of the things Compassion in World Farming look for when bestowing a Good Chicken Award apart from slow-growing birds are lower stock density and also "enrichment provision". This means access to natural light, straw bales, perches, pecking objects and shelter outdoors - all of which Chris’ chickens enjoy in abundance.